Escaping volatility by sidelining cash pays nothing. Instead, investors can sit in a high-yielding stock with great expectations while the market makes up its mind. A stock screen for 10%+ upside, 5%+ dividend yield, and positive free cash flow returned 13 stocks. Five stocks were selected for further comparison, representing Energy, Telecom, Real Estate, and Consumer Discretionary. 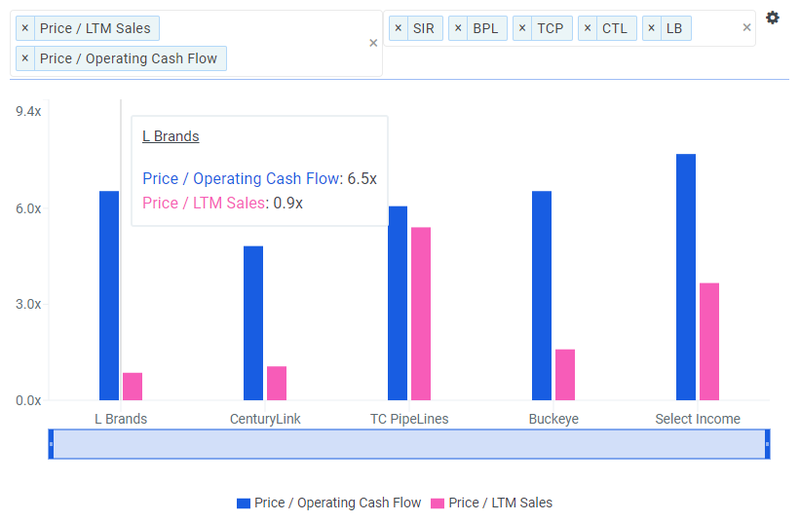 TC Pipelines, LP (NYSE: TCP) scored best in the rank analysis, factoring in yield, average upside, and a group of relative valuation, coverage, leverage, efficiency, and technical metrics. However, TCP has some headwinds, and Buckeye Partners, L.P. (NYSE: BPL) may be a safer bet. Market volatility is scarily high. Interest rates on sidelined cash are scarily low. Investors looking to de-risk or take some profits off of the table have a better option than financing bank loans: high-yielding dividend stocks with upside. 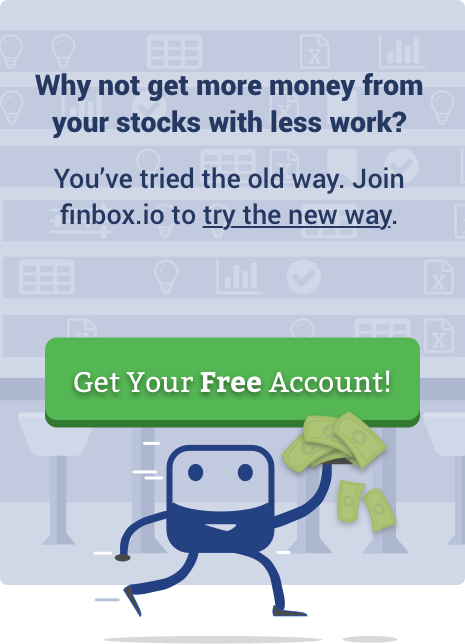 Finbox.io's stock screener is an easy way to identify these stocks. 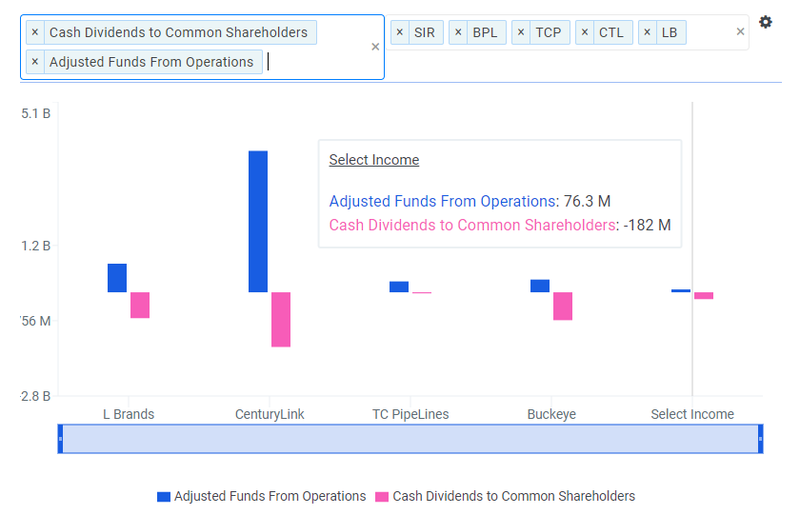 Filtering primarily for 5%+ dividend yield and 10%+ upside by both Wall Street analysts and Finbox.io's quant valuation model produced 13 candidates. These high-yielders are obviously dominated by Energy and Real Estate stocks, but four sectors in total are represented. The screener image below shows the top yielding stocks in the group. The top four were selected for further analysis, as well as the only Consumer Discretionary stock to make it past the filter. Buckeye Partners L.P. (NYSE: BPL) - Owns and operates liquid petroleum products pipelines in the United States and internationally. TC PipeLines, LP (NYSE: TCP) - Acquires, owns, and participates in the management of energy infrastructure businesses in North America. Centurylink Inc (NYSE: CTL) - Provides various communications services to residential, business, wholesale, and governmental customers primarily in the United States. Select Income REIT (Nasdaq: SIR) - A REIT that owns properties that are primarily leased to single tenants. L Brands Inc (NYSE: LB) - Operates as a specialty retailer of women’s intimate and other apparel, beauty and personal care products, and accessories. 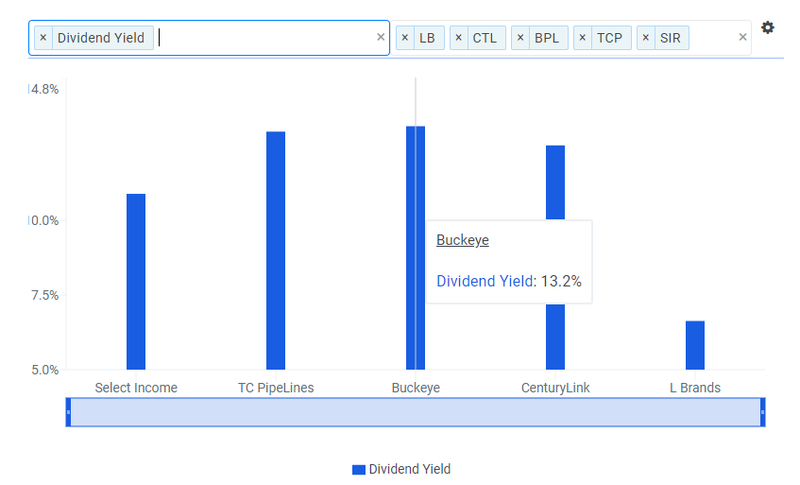 The two energy MLPs lead the pack as far as didvidends, with Buckeye yielding 13.2% and TC PipeLines paying 13.0%. The retailer L Brands pays out the least at 6.6%, but is forecast by the quant valuation models to have the most upside. Analysts expect L Brands to appreciate by nearly 24%, while the Finbox.io Fair Value is more optimistic at 33.6%. 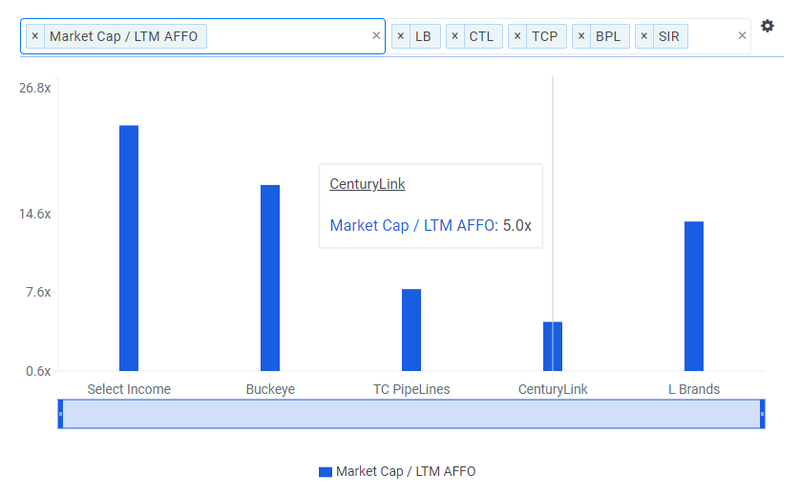 CenturyLink is the laggard here, with 12.4% upside expected by analysts and 14.4% by the models. Typically, investors analyze companies by benchmarking them to their industry peers. In this case, these five stocks span four different sectors. Further complicating the comparison is their various legal structures. While CenturyLink and L Brands have more traditional corporate structures, Select Income REIT is a real estate investment trust and the energy stocks are limited partnerships ("MLPs"). Traditional comparison metrics, such as P/E ratios, will not work across all of these companies since the REIT and MLPs have skewed earnings and net profit margins due to depreciation, gains/losses from buying and selling assets, and accounting for required maintenance of the assets. Since the P/E ratio is not a valid comp in this scenario, two other price multiples will be useful. Price/Sales (pink bars) bypasses the depreciation issue. 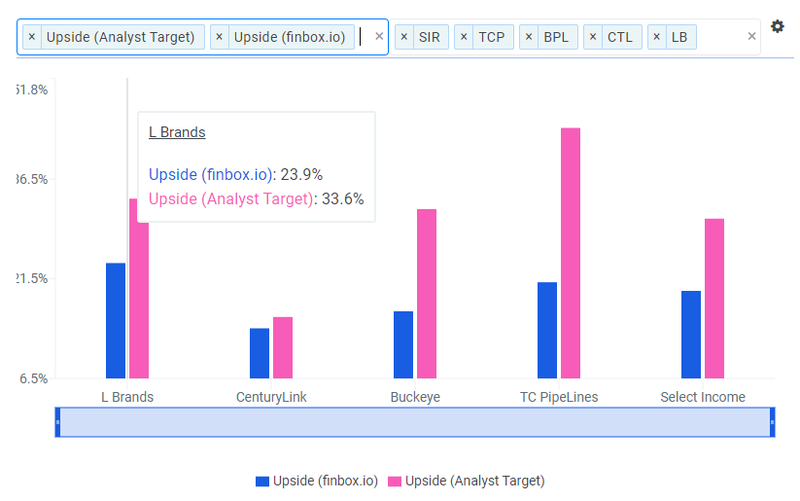 L Brands has the best sales multiple of the group, whereas TC PipeLines is the worst by nearly double the next closest. Price/Operating Cash Flow (blue bars) also ignores depreciation, as it is a measure of the actual cash generated by the company. In this case, CenturyLink sports the best multiple, but most of the stocks trade in a reasonable range. 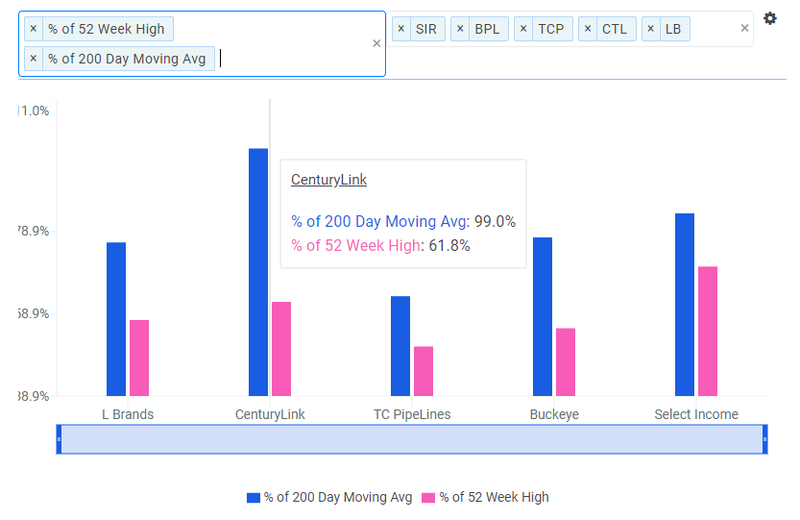 Overall, as far as top-line price multiples, CenturyLink and Buckeye look the cheapest. 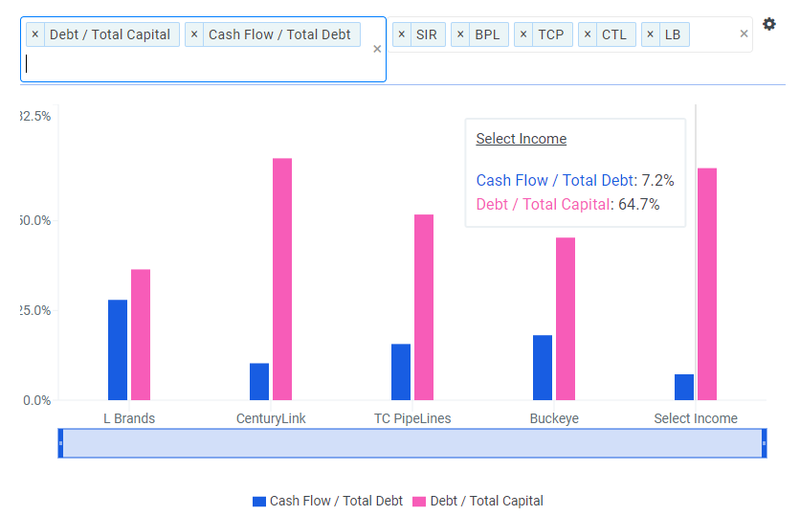 Another cash flow multiple uses Adjusted Funds from Operations, a traditional REIT measurement. In this case, Finbox.io has AFFO for for all five companies, which deducts maintenance or recurring capex from operating cash flow and represents cash available to distribute to shareholders. The ranking of Market Cap/AFFO multiples is mostly the same as the Price/Operating Cash Flow in the prior chart. 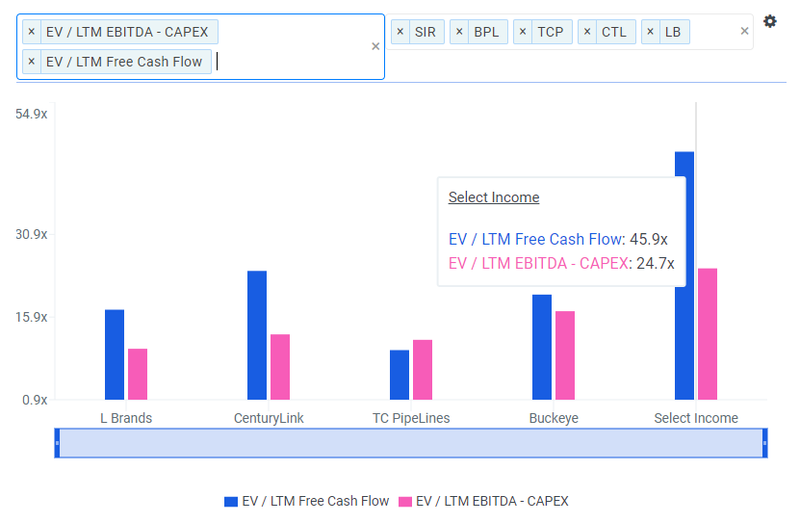 The next two multiples feature Enterprise Value, which takes the market cap of the stock, and adjusts for debt and cash. It is a proxy for the actual purchaser price of the company. The denominators in this case aim to show how much is left over for investors after the company funds operations. EV/Free Cash Flow (blue bars) is a more honest metric for valuing stocks thanks to its lower potential to be engineered than earnings. Also charted is EV/(EBITDA-Capex), which puts these firms on a more comparable footing. Select Income REIT fares the worst in these measures, while TC PipeLines and L Brands look the most attractive. Nice Dividends, Can They Afford Them? Traditional payout ratios are not a fair comparison across these stocks, as net income can be skewed with the REITs and MLPs. Another way to get at the affordability question is by comparing AFFO to dividends paid. 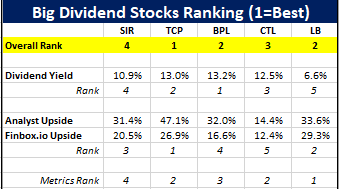 SIR's dividend payout ratio (dividends/AFFO) is the worst at 238.5%, followed closely by Buckeye's 219.5%. Paying out more cash than the company generates is a red flag. TC Pipelines (9.7%) and CenturyLink (39.5%) appear more conservative. L Brand's 90.5% payout ratio is fairly aggressive. As a check to Dividends/AFFO, two more traditional measures are shown below. Payout Ratio (blue bars) is dividends/net income, but recall that net income will be overly deflated due to depreciation for the MLPs and REIT. 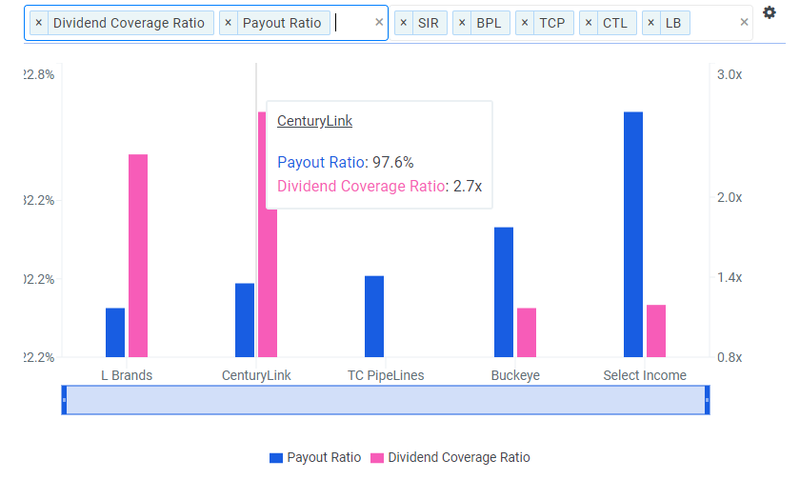 The Dividend Coverage ratio (pink bars) is dividends divided by cash and cash equivalents. MLPs and REITs will not be sitting on cash like traditional stocks, so this ratio should be low. Note that L Brands and CenturyLink Payout Ratios flip when using net income rather than operating cash flow. Companies that can't afford to pay dividends must borrow or sell more shares to keep up appearances. All five companies have seen their debt/equity rise since 2014. Select Income REIT jumped from 30.1% to 155%. TC PipeLines more than doubled from 106.9% to 225.0%. L Brands has negative total equity, so the ratio is not available for the stock. Another debt level comparison uses debt/total capital (pink bars). 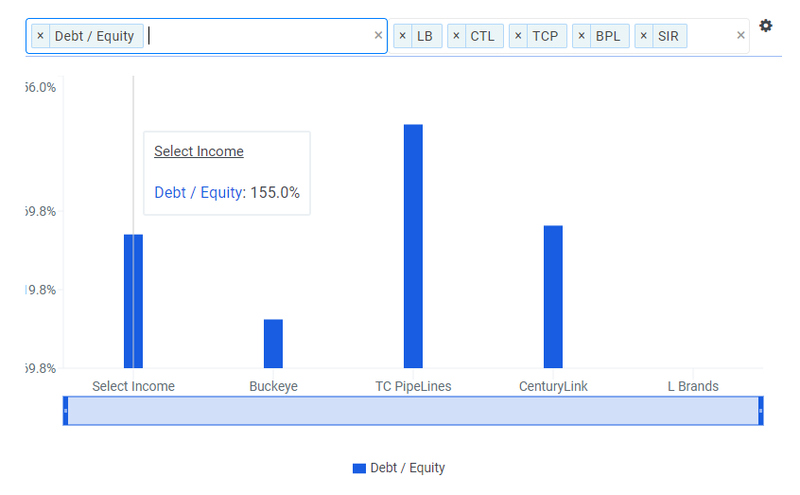 CenturyLink and Select Income REIT have the most leverage, and using cash flow/total debt, both also have the least amount of incoming cash relative to their debt load. One last look at affordability features the Interest Coverage ratio. It is shown in two flavors, before and after depreciation and amortization. 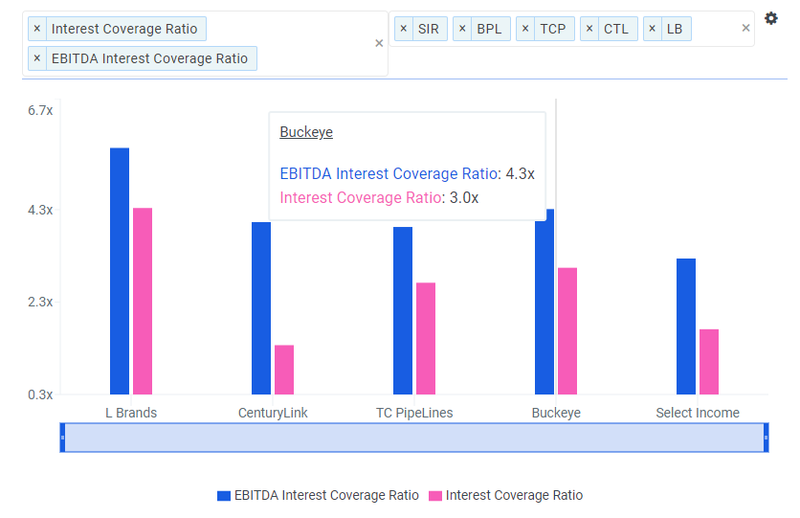 Based on EBITDA, all five companies can easily cover interest expense. The most popular efficiency metrics depend on some measure of net income. Getting a feel for how management is executing is possible using less common measures. 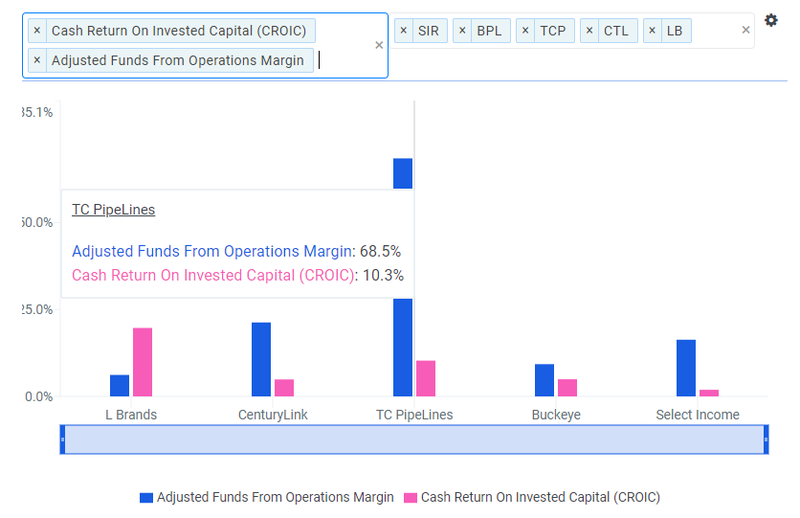 AFFO Margin (blue bars) and CROIC (Cash Return on Invested Capital) use cash flow to help compare across these varied structures. 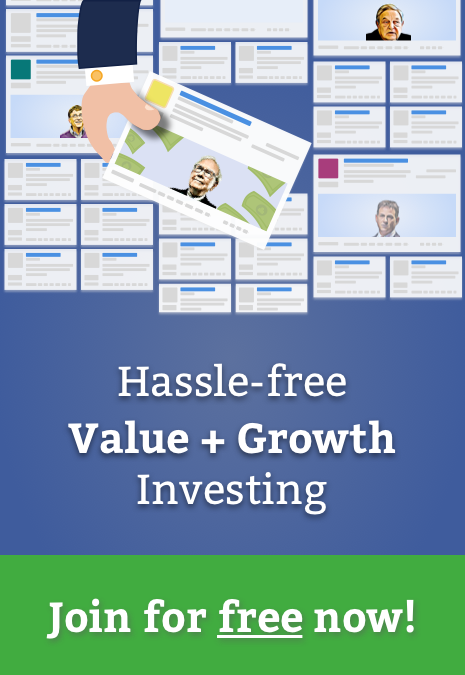 CROIC measures how well the companies convert debt and equity into free cash flow. L Brands and TC PipeLines are winning at this efficiency ratio. Another efficiency metric shows how well these stocks utilize their asset base. 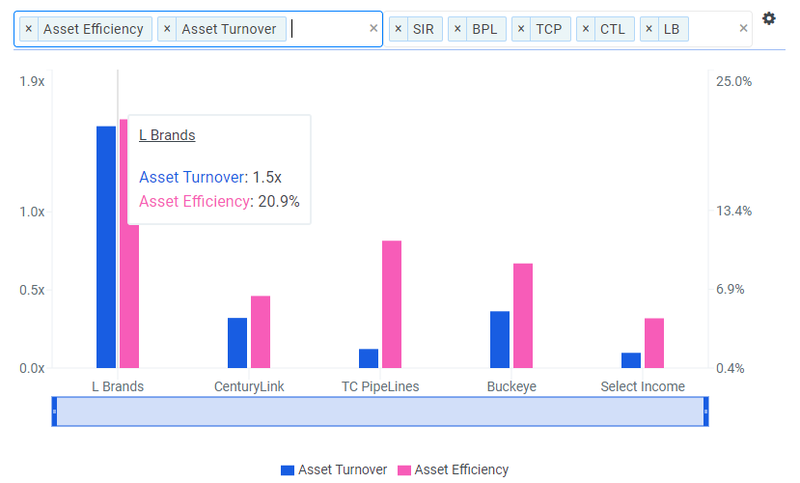 Asset Turnover (blue bars) compares revenue to total assets. Asset Efficiency ratios cash flow to total assets. L Brands and Buckeye come out ahead when combining these measures. A final comparison looks at the tape. CenturyLink is the only stock that has not broken down below its 200-day moving average. While it is not unexpected that high-yielding stocks are probably beat down, all of these names are trading in the upper half of their 52 week high. A higher percentage in both of these numbers tend to point to a healthier stock. TCP has the upside because of a precipitous fall in March due to proposed changes in tax regulations by FERC, which regulates rates on interstate pipelines. Management does not expect any effects from these regulations until 2022, if they are enacted. Analysts are mixed, with EPS upgrades and downgrades about even over the last 30 days, but zero changes in the last 7 days. Tied for second place are retailer L Brands and another MLP. LB scored best in the metrics and has the second most upside. However, one scroll through Finbox.io's Historical Trends gallery shows falling revenues, margins, and EPS. Buckeye Partners has the top yield, but the next to lowest upside of the group. It also must face the FERC revised regulations, but sees no material impact. The market currently sees BPL as making it through the proposed regulatory changes better, but Wall Street analysts have not reflected the panic yet in TCP's estimates. Buckeye is the safer choice here, but if the market comes around to TCP management's view, upside could range from 27% to 47%, whereas Buckeye might see 17% to 32%. Either way, safe or risky, enjoy 13%+ yields and 17%+ upside.